PUNE: The Janaseva Awards were recently given away at a special ceremony organized by Janaseva Sahakari Bank on the occasion of 45th Anniversary of the bank. 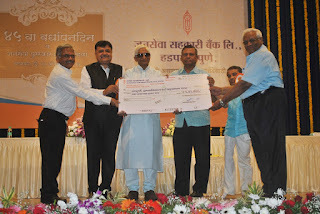 The award ceremony took place at Lokshahir Annabbhau Sathe Natyagruha, Padmavati. The Janaseva Award 2017 was given to ‘S.A.K.S.H.A.M’ (Samadrishti, Kshamata Vikas Evam Anusandhan Mandal), an organization that focuses on development of creates awareness in society about differently abled people. Dr. Milind Kasbekar, Head of the Organization, S.A.K.S.H.A.M accepted the award. Bhaiyyasaheb Tayde, Regional President of Pune, C.A. Pradeep Jagtap, President, Janaseva Sahakari Bank, Dr. Rajendra Hiremath, Vice President, Janaseva Sahakari Bank, Shirish Mahabal, Chief Executive Officer, Janaseva Sahakari Bank were present during the event. Prakash Pathak, President, Bhosla Military School, was the Chief Guest for the award ceremony. The event was anchored by Vinaya Desai while Balasaheb Kachre gave the vote of thanks.